← WHERE in the world am I? You know you’ve made the big time when the Wall Street Journal writes about you. (Either that, or you’ve jumped the shark.) Twitter got a lot of love this week, both from the Journal and at the SXSW conference. Twitter asks simply “What are you doing?” More precisely, it’s what are you doing right now. In 140 characters or less, you describe what you’re doing. Then any of your friends (or the whole world) can see what you’re doing. You can see what I’m doing right now. If you really care, you can get notified on your cell phone or by IM anytime I update what I’m doing. I was introduced to Twitter about a month ago by the design harem at AOL: Carol, Lisa and Nicole. Twitter is essentially a lightweight blogging platform that significantly reduces the PITA factor of blogging. I have to sit down and think to blog, and I typically spend 15-45 minutes on each blog entry – thinking through what I want to write, uploading pictures, making links. Twitter dispenses with all that – with only 140 characters, there isn’t much thought necessary. Much like slickr, it’s an easy way to passively keep track of what your friends are up to. People aren’t thrusting their lives upon me; I can keep up as much or as little as I want. Twitter’s value increased greatly with the Twitter WHERE widget. (See my post on WHERE.) With WHERE, I can quickly and easily answer not only what I’m doing right now, but where I’m doing it from. 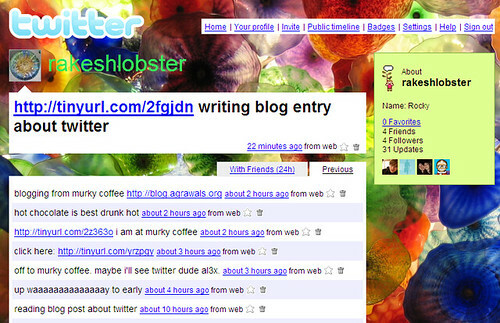 The Twitter widget includes in each entry a link to a map of where I was when I posted the entry. You can see where I was when I wrote this entry. In real time, it also serves as a passive invitation to friends. If someone wants to come hang out with me as Murky Coffee, they know where I’m at. The last block problem makes that a little tricky. Because GPS has a degree of inaccuracy and because places aren’t always where maps expect them to be, the location that is displayed needs clarification. My Twitter shows me at 1105 N. Kirkwood. Although you could see Murky Coffee from there, the actual address is 3211 Wilson Blvd. It would be nice to be able to select from a list of businesses near the location and send that information in the Twitter instead. Right now each GPS Twitter entry is isolated. But it’s not hard to imagine pulling up a map with the friends around you. Or being able to create a track log of where you’ve been. I’ve told my friends that if I ever go missing, they should check my flickr account to see if I left a picture of where I last was. With GPS Twitter, they’ll know where I was. This entry was posted in blogs, flickr, gps, instant messaging, lbs, mobile, social networking, twitter, web 2, web 2.0, where, wireless, wireless data. Bookmark the permalink. Here’s an interesting Twitter/Google Maps Mash-up. Love the mash up. Thanks for the pointer, Jason. What can Twitter actually do for my business?